When I was a kid I got an electronics kit for Christmas or a birthday present. It came with a whole bunch of components on a board, and you used wires to connect them up to make various circuits. 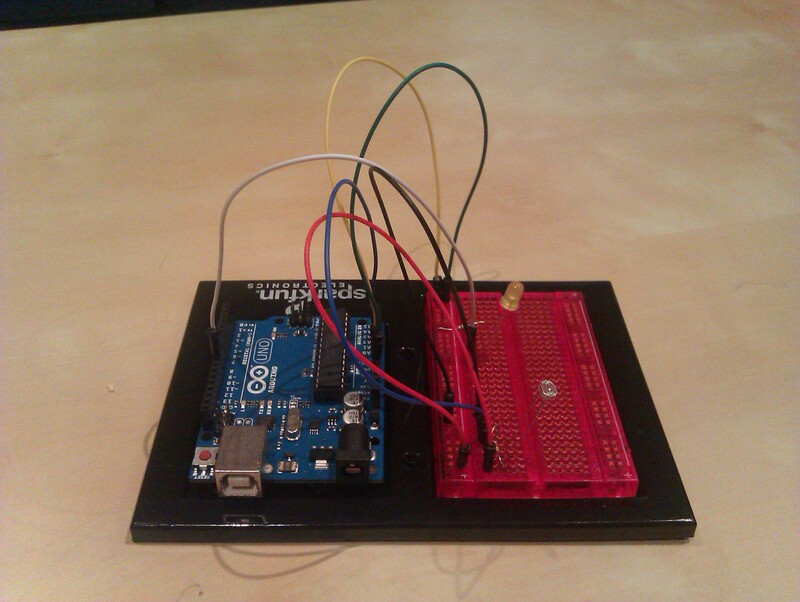 Well, I recently bought the modern version of this kit – an Arduino board. According to their website, “Arduino is an open-source electronics prototyping platform based on flexible, easy-to-use hardware and software.” You buy the board and some electronic components, download the software, program the circuit, and upload it to the Arduino. I’m very much still at the learning stage with it. The kit I bought is the SparkFun Inventor’s Kit, which comes with the components you need to build some basic circuits which teach you about the basic principles of circuits. So far I’ve managed to get some LEDs to flash, a servomotor to spin, and used a photocell to change the brightness of an LED. It’s been seven years since the original 23 Things Learning 2.0 program was created by Helene Blowers for the staff of the Public Library of Charlotte and Mecklenburg County library system. The program was used by hundreds of libraries from around the world to allow their staff to learn about the new web 2.o tools which were being developed. At my workplace we delivered a web 2.0 training program to staff in 2010, but only focused on four tools (blogs, wikis, IM, and RSS feeds). Michael Stephens and Warren Cheetham undertook a study in 2012 to investigate “The Impact and Effect of Learning 2.0 Programs in Australian Public Libraries“. In the last few days, the newest version of 23 things has been launched, and it looks at mobile technologies that library staff need to be familiar with. It’s called 23mobilethings, and is based on a Danish program created by Jan Holmquist. Jan is working with Mylee Joseph and Kathryn Berwick from the State Library of New South Wales to develop the English-language version. The “things” include Twitter, Dropbox, curating tools such as tumblr, and photo apps such as Instagram. I don’t know if I’ll have time to do all 23 things, but there are a couple that I might have a look at. I think I’ll share this course with the training and development staff at work, and see if we could run another cut-down version for our staff. Geocaching has many examples of creativity. Some geocache hiders create very elaborate containers when they hide a geocache. Others might come up with a creative challenge cache that makes finders go caching in a particular way. 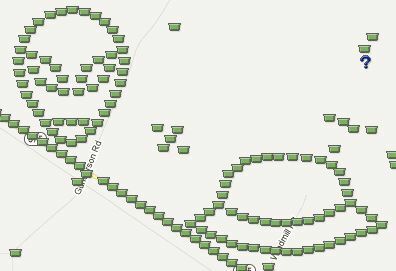 And then there’s geo-art. 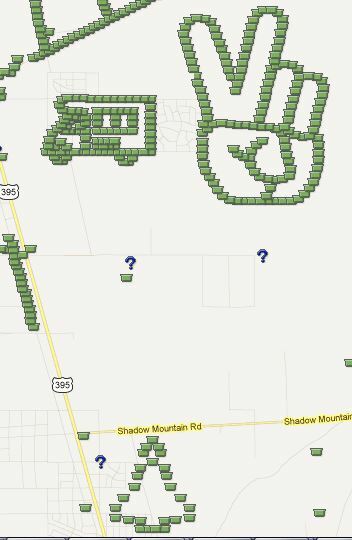 Geo-art is the placing of caches in such a way that they form a picture or pattern when viewed on the cache map at geocaching.com. Most geo-art seem to be in the western US, where there’s lots of open space for the caches to be placed. I’ve provided links for one of the caches in each piece of geoart. To see the full piece of art, you’ll need to click the “View Larger Map” link above the second map on the page (the one on the right-hand side just before the logs begin). There’s also a cyclist in Ohio, and a steam train near Boise, Idaho. In Sweden, there’s even geoart of a saint. And in California there’s a space shuttle, peace sign, and Winnebago. The following examples aren’t structly geo-art, but they’re still pretty cool to see. 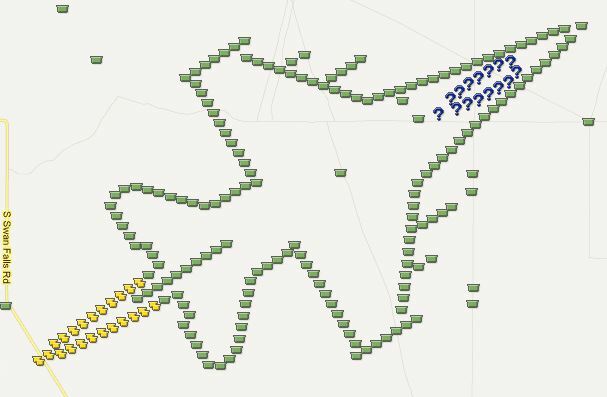 In Hungary, cachers have placed a series of caches which outline the border of Budapest, and in Latvia they’ve gone one step further and outlined the border of the entire country with puzzle caches. My favourite example of geo-art is the F-16 Falcon fighter jet, which has been placed in Idaho. They’ve managed to use different cache types to add colour to the picture. If you wanted to see some other examples, there’s a geoart board on Pinterest. 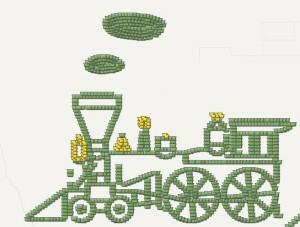 A web search for “geocaching geoart” will also bring up lists of geoart creations from around the world. I’m not aware of any geo-art in Australia, yet. 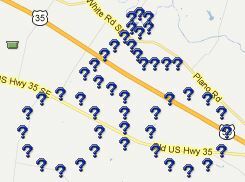 I guess it’s because there aren’t enough geocachers in the areas where there’s enough space to create it. Maybe you could try and create some geo-art on a small scale?